Daily Forex News – The early part of the week will probably be dominated by events in the oil market following Sunday’s meeting of oil producers. The result of the meeting wasn’t known at the time of writing. The oil market’s response could dictate whether there is “risk on” or “risk off” sentiment in the market, with all that that implies for currencies, particularly CAD and JPY. 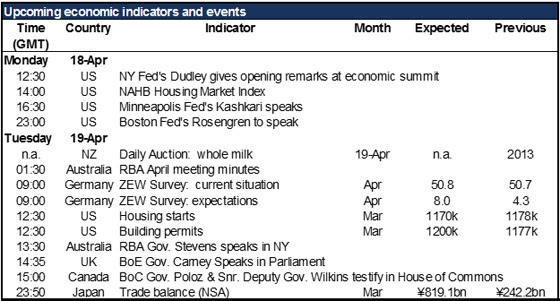 The other highlight of the week is on Thursday, the ECB holds its April meeting. Only a month after they announced an extensive set of new measures and ECB President Draghi said “we don’t anticipate that it will be necessary to reduce rates further,” conditions in the EU haven’t worsened enough by any means to necessitate further action. Nonetheless, with the euro strengthening since the meeting and financial markets of the countries that were supposed to benefit from the measures still struggling, the markets will want to hear some measures of support from Draghi. EUR often weakens in the run-up to ECB meetings and so far, this time has been no exception. There could be some bounce-back following the meeting if Draghi just reaffirms his previous stance.